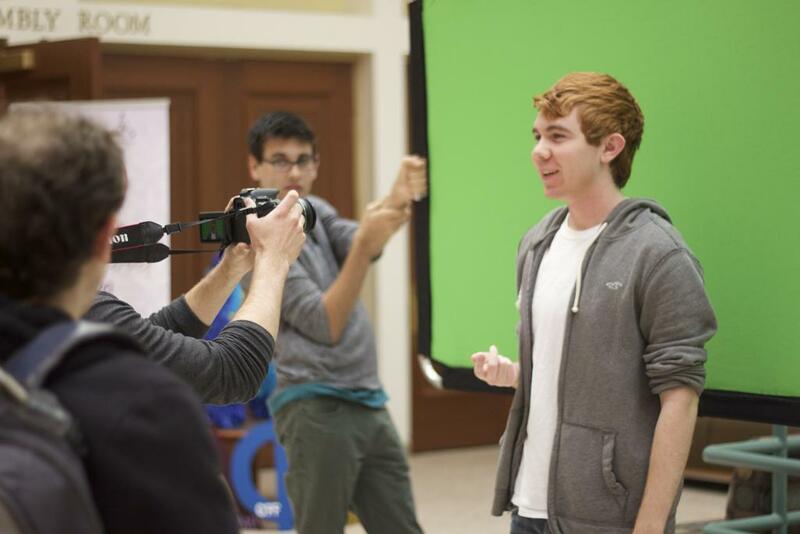 At University of Pittsburgh Television’s 24 Hour Film Festival last Friday night, Zack Williams’ team had only three rules: The short had to be about a conspiracy, feature a pair of sunglasses and use the station’s green screen. The end result was a satirical movie trailer featuring Williams, a junior communication major, as he struggled to expose the star of Apple’s “Get a Mac” campaign. The festival rounded out UPTV’s, Pitt’s student television production organization, Station Launch Week, which ran last Monday through Saturday. With events such as a dance party in Towers lobby and a meet and greet with dogs outside the William Pitt Union, UPTV celebrated its return to Pitt’s closed-circuit network after remaining off air for months while the University switched from standard to high-definition broadcast. Launch Week concluded with the annual 24 Hour Film Festival, which ran from Friday to Saturday night. Club members split into teams to write, shoot, edit and premiere a short film in under a day, with offbeat prompts and rules — squads had to include anything from a spatula to a photo of President Obama eating an ice cream cone in their movies. Aside from “iLong,” the festival produced titles such as “Doo Detective,” a “True Detective” parody featuring Shaggy and Scooby Doo as the leads, and “Spatulove,” a Christmas tale featuring a boy who gets a curious visit from an “As Seen on TV” spatula salesman. Five teams of up to six members each participated in the event, with each typically shooting most of its footage Friday night and early Saturday morning, then editing its footage down to anywhere from three to seven minutes long. On Saturday night, about 30 people attended the screening at the Cathedral of Learning to see what they came up with. For Williams, who previously starred as Kent Clark in UPTV’s popular web series “Real Sorority Girls,” the 24 Hour Film Festival is a way for new and prospective members to get involved with UPTV. Launch Week caps a successful two-year period for the club, which saw UPTV double its membership from about 40 to 85 people. During this time, UPTV also started producing videos for student groups, including Student Government Board, Pitt Dance Ensemble, The Pitt Pulse and Formula SAE. According to Jamie Bergey, senior film studies major and UPTV’s president, this brought positive student body attention to UPTV. In addition to producing videos for other clubs, Student Affairs and the film studies department have reached out to UPTV for potential collaboration opportunities. Those newly interested in the club include Hsuan Chang, a junior business and psychology major. After checking out UPTV’s meetings for the past few weeks, Chang attended the 24 Hour Film Festival’s screening with a friend. Impressed by the shorts, Chang hopes to see similar work from the station in the coming months. Bergey shares Chang’s aspirations, aiming to stay true to UPTV’s original name when it started more than a decade ago — Creation Station. She hopes Pitt students will continue using UPTV’s equipment to produce anything they want, whether it’s a comedy such as “Real Sorority Girls,” or more dramatic work, like Williams’ upcoming short film about two people who meet in a hospital’s psychiatric unit.